The theme park, the ultimate fake reality, in order to create the illusion of being an authentically evolved - ie not master planned - space generally has to scatter about things we'd expect to see in real places to create the idea that the theme park spectator is somewhere that is actually meant to accommodate people, not just to service them. As such around The Magic Kingdom we find fake balconies with furniture set for nobody to overlook a local scene that doesn't exist, false portals which suggest whole rooms that aren't there, and landscapes which continue on through space only through the miracle of the black rear wall. With all this artificial space leading away from us, all these planned 'accidental' details in every corner, all these old decaying buildings which are actually big modern warehouses, it's pretty logical that Disney would seek to control even the perception of time itself. They do through the creation of the interior exterior, but unlike the modern casino - where the interior is a maze from which you intentionally cannot escape - Disney allows you to see clocks, timepieces, and other signifies of your fleeting time in their constructed reality. But rather than treating these timepieces as invasions of non-Disney space as a more controlling design team might think to, Disney places them as signifiers of culture. Our relationship to clocks has always been somewhat untrustworthy anyway: time, one of man's original and most crucial inventions, has allowed many great and important things to come to be, yet the clock has controlled man's movements since it's inception. 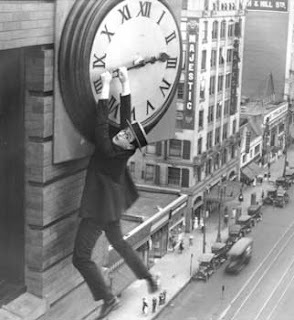 Timepieces were, in the 19th century, a luxury only the richest could afford and such a mark of conspicuous consumption for much of that era; in the 20th century they became a signifier of a system of life, and the 20th century's most vivid image of a clock is a fatal one: Harold Lloyd dangling from its' hands at the top of a tall building. There has always been something slightly untrustworthy about a clock: a device which, once constructed and turned on, runs by itself and schedules the life of its' creator. Disney uses clocks as signifiers of culture, and The Magic Kingdom prepares us for this by presenting a litany of clocks as we enter Main Street: atop the train station to remind us of the railroad and it's schedule, at the front of City Hall - the representation of government and order - to remind us that law runs on a clock, and outside the Emporium to remind us that even commerce is dictated by the hour. Each land has a central time piece, like Fantasyland's Pinocchio Village Haus where little automated clappers in each bell chime the hour. Small World's whimsical clock, imported from Disneyland, produces a parade of children every fifteen minutes to recall the global nature of time and the unity among cultures it provides. This appraisal, of course, purposefully ignores Fastpass-instituted clocks and numeric readouts which are not part of the original design scheme. Frontierland, curiously, and Tomorrowland, logically, include no clocks. Frontierland's railroad station, the chief signifier of the advancement of culture into the uncivilized frontier (see Once Upon A Time in the West), curiously includes no signifying clock on its' facade, not even in the original red and white gingerbread house version of the structure. There is a tower for the "City Hall" of Frontierland, the highest point in "Frontierland proper", yet there is no clock there. Tomorrowland, of course, a world where intelligence is centralized and even the modern Peoplemover requires no operator, has no need of clocks. Adventureland has no clocks in the bulk of itself, not even in the Swiss Family Treehouse, where the theme of the attraction is of man's conquest of nature when left to his own devices. Yet once the spectator approaches Caribbean Plaza and all that wild plant life stops spilling out through crude fences and barriers and starts to be contained in planters and flowerboxes, suddenly a clock appears on a Spanish fortress and the message that culture brings timepieces with it becomes abundantly clear. 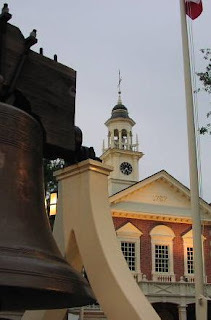 In this context the clock atop the Hall of Presidents, Liberty Square's most important structure, is also rational. Yet that Caribbean Plaza clock is of course deceitful, for the fort is already under attack by agents of anarchy - the pirates - and the clock is marked as potential fodder for the flames that consume the island society which built it. Magic Kingdom's strangest timepiece is, to my eye, the largest and most beautiful: the clock on the front of Cinderella Castle. Although this is the clock which proves the argument (timepiece = cultural institution), it's placement is perhaps more pragmatic than meaningful ("since this is where you all will be waiting for the entertainment option - have a clock"). Yet the beauty of the clock and it's size makes it's bearer all the more into an inspiring edifice, one of apparent timelessness despite being a fraction of a tenth the age of any authentic castle in France. There are many other minor timepieces, all of them generally serving to reinforce the park's message of order and safety, and they are perhaps the most appropriate symbol for the Disney model of theme design and it's relentless effort to remake all of culture past and present into an automated exhibit. The clock reminds us of clockworks, and Disney has the largest collection of clockwork automatons in the world - their grotesque Audio-Animatronics, more real than real. 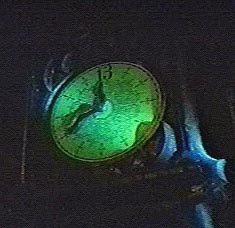 Yet there is one brilliant clock in the park which both subverts and reinforces these enchanted, significant timepieces - it is the literally demonic clock of the Haunted Mansion, occurring at exactly the midpoint of the ride, and moments before the first "big" special effect. It tells us that time runs differently in this attraction, and may be the best single symbol for the attraction in it. Yet it also suggests that the larger forces at work in the park may not be as orderly as they seem, and occurring moments before we meet a decapitated medium, it's function as a potential oracle of the larger park makes it equally significant and haunting. It's the one moment where the park's machinery seems to start to self destruct before our eyes.